This is God’s response to the faithful actions of His servants. Notice this says nothing about things that are outward or even anything that has to do with the source of the burdens we bear, but rather instead has everything to do with our inner selves, our hearts, or spirits you could say. The psalmist cried out to God because his “soul” was overloaded and we too should recognize that all of the burdens of life affect us most intimately and profoundly on the spiritual level. In our grief and under our burdens we can so easily get caught up on the symptoms of our struggles rather than really getting to the source. God always addresses the source of such things. Consider, the story of the paralytic brought to Jesus by his friends who cared so deeply for him they broke a hole in the ceiling of the house and lowered him in so he could get to Jesus. Take a moment to read Luke 5:17-26 and notice what Jesus saw first and how that led Him to respond. God told Paul that though he struggled with his “thorn in the flesh” His grace was enough for him. That sounds nice but I will tell you, I don’t think that is the answer Paul wanted to hear, and I know it is definitely not the answer I want to hear when I am struggling. Yet it is often what we really need in order to grow in the ways the Lord would have us too. Which in the end is not just better for ourselves but better for all those we come in contact with. So let’s now take a moment to consider how the Lord can “enlarge my heart” and how that is the solution to getting above life’s burdens. Imagine your burdens as a chain which constricts and restrains your soul (your life). Then imagine that chain is tied back to the existence of sin in all of creation. Now, sin is what gives that chain real weight and power in your life. You are unable to fully escape the chain with its weight/power because as long as you live in a sinful world and in sinful flesh it will always be there. However, God is able and desires to enlarge your heart. How does He do this? By what the psalmist pointed out earlier in the psalm in his six appeals and actions. Specifically, God’s Word, Work and Way. So now imagine your soul (life) as a container that when you submit to God’s Word, Work and Way you are filled up with the things of Him (His Grace) and grow. 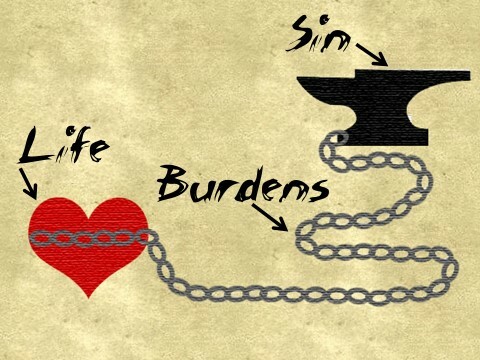 Now the chain does not change, it remains the same but as you grow you pull more and more slack from the power of sin (the ultimate source of our burdens) in your life. Also notice that though the chain is the same size it appears smaller because your soul has grown larger thanks to the Lord. What we must realize is this, that you can never be fully free from the burdens of this life. 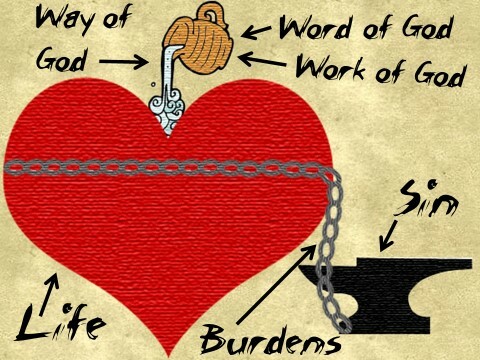 As soon as you get rid of one burden you will pick up another and that is why you must daily choose God’s Word, Work and Way so that your heart (your life) continues to enlarge and you are better able to cast all your burdens before God and take upon yourself the yoke that He has prepared for you. It is only then we can enjoy the abundant life which Jesus came to give us. There is strength in the Lord, this is why Paul proclaimed in 2 Corinthians 12:10 “Therefore I am well content with weaknesses, with insults, with distresses, with persecutions, with difficulties, for Christ’s sake; for when I am weak, then I am strong.” This is what Christ was pushing us towards when He spoke the words of Matthew 11:28-30. At the foot of Christ, we come to lay down our burdens and even all of our strength recognizing we cannot do this alone and when we do so He takes our burdens and instead gives us His burdens, His purposes, which should then be our focus as we wander down life’s road. 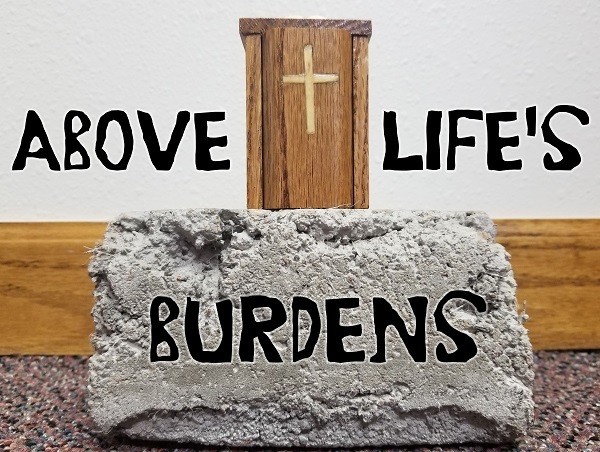 If we want to get above life’s burdens, we must first find ourselves at the feet of Christ and receive a hand up to be placed on the Solid Rock Who withstood the great penalty of mankind’s sin and therefore can withstand any burden that comes against Him.